Challenger mobile lifts provide the flexibility and convenience to lift any rubber tired vehicle, from small passenger cars to the largest two, three or four axle vehicles from 27,000 lbs. to 108,000 lbs. without taking up an entire bay. Our Heavy-Duty mobile lifts are also capable of lifting vehicles of any axle length or wheelbase. Our Heavy-Duty mobile lifting system along with optional sets of accessory support stands will accommodate multiple bays with one lift system. Robust yet easily maneuverable mobile columns can be operated on almost any solid surface, in-doors or out. 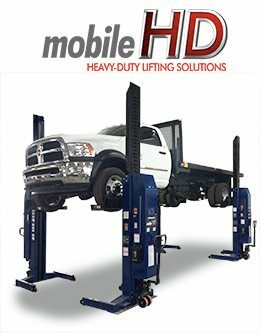 CLHM-185 Mobile column lifts offer 18,500 lb. lifting capacity per column, wireless, battery, and hydraulic operation with adjustable carriages. 110 volt built in multi-stage charging system. Wireless system for clutter free work area without cables to connect, navigate around, roll-over or replace – No power cords or communication cables to get tangled or damaged. Adjustable carriages eliminate the need for small wheel adapters while providing the necessary width to accommodate larger wheels. Linear position transducers maintain system synchronization and ensure maximum reliability. 12 radio frequencies with a channel range from 100-120 for each frequency to prevent radio noise from interrupting service. Battery operated 12 volt deep cycle battery(s) eliminates the need for power source hook ups. Integrated weight gauges help prevent column overloading and ensure locks are properly engaged. 25 heavy-duty safety locks every 2-1/2″ allow technicians to work at an ergonomic height to increase productivity and minimize fatigue.